The 5-passenger 2016 Mercedes -Benz C300 has a starting MSRP of $38,950, and more than lives up to its reputation as a lively, powerful sedan that delivers an exceptional ride to discerning Brampton drivers. 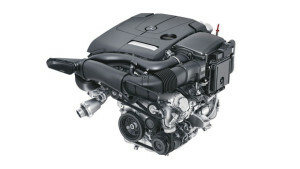 From its engine and drivetrain, to its stability and braking systems, the C300 is every bit as suave as it is fuel-efficient and driver-focused. Let’s take a closer look at the efficient and well-rounded 2016 Mercedes-Benz C300 sedan’s specifications. The 2016 C300 is powered by a 2.0L turbo 4 engine that generates 241 hp at 5,500 rpm and 273 lb-ft of torque at 1,300-4,000 rpm. This powerful engine can go from 0 to 97 kph in 6.2 seconds, and is paired with a responsive 7-speed automatic transmission that features paddle shifters for a fully immersive driving experience. The die-cast alloy block and head construction make it lightweight, contributing the C300 sedan’s EPA-estimated 9.4 L/100km city/6.9 L/100km highway rating. The fuel tank holds 65.9 litres of Premium unleaded gasoline. 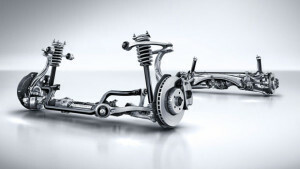 The suspension on the C300 features a 4-link front axle with lightweight aluminum components, redesigned by Mercedes-Benz to further advance the already standard-setting 5-arm multi-link rear design. It utilizes rack-and-pinion steering with electromechanical power assist for greater feedback through the steering wheel. The Electronic Stability Program (ESP®) continually monitors driver inputs and vehicle motion to keep steering on track, especially around corners and during evasive maneuvers. If wheelspin, severe understeer, or severe oversteer is detected, the ESP® can brake individual wheels and reduce engine power, helping to bring the vehicle back under control. 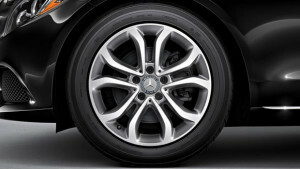 Each C300 is outfitted with 5-spoke 431.8-millimetre wheels and all-season Extended Mobility Tires. Adaptive braking technology brings C300 drivers a suite of braking advances, such as Predictive Brake Priming, which sets the pads closer to the discs for a more immediate response if you lift off of the accelerator quickly. Automatic Brake Drying works to remove water build-up from the discs during rain, and Hill-Start Assist helps to prevent rollback during uphill starts. The Anti-Lock Braking System (ABS) can pump the front brakes individually or the rear brakes in unison up to 30 times per second to prevent lockup. To learn more about the 2016 Mercedes-Benz C300 specifications, visit Mercedes-Benz Brampton in Brampton, Ontario! Our knowledgeable staff are happy to answer any questions you may have, and we’d love to arrange a test drive so you can see the C300 in action. Give us a call at (888) 436-3849 to learn more!